Heavy Tank T26E1-1 "Super Pershing"
The Heavy Tank T26E1-1 "Super Pershing" is a Rank IV American heavy tank with a battle rating of 6.3 (AB/RB/SB). The T26E1-1 was added with Update 1.57 "Battle March". The tank takes the basis of a normal M26 Pershing, then increases its armour with welded-on metal slabs and up-guns it with a T15E1 cannon, which is nearly identical to the one in the T32. This gives the tank a much appreciated armour protection and firepower for the battle rating and is comparable with the premium M26E1. The left turret side has a few tracks welded on, providing an additional 30 mm of armour where they are. The "ear flaps" on the turret provide 38.1 mm of armour. The steel on the gun mantlet gives an additional 80 mm of armour. Front glacis have sheets of 38.1 mm armour added on, sloped at varying angles. Ammo racks of the T26E1-1. This is not exactly a brawling tank. Try to take the shots that is positive to hit and then fall back into cover. Don't stay exposed too long as enemy shells will most likely penetrate the armour. Try to stick with an ally, going of alone can/will be suicide. Same 90mm gun as the T32 and the premium M26E1. M82 APCBC shot is available that can mess up any penetrated tank's internals. .50 on top of the turret is useful against low-flying aircraft and lightly armoured vehicles. 204 mm of penetration for the M82 shot makes Tiger IIs less of a threat when met dead-on. Front spaced armour can reduce effectiveness of HE and HESH rounds. Despite the add-on armour, the armour is still inefficient for the BR. Spaced armour doesn't help against HEAT. The add-on armour has a negative impact on mobility on the already sluggish M26 it is based on. Gun gets damaged quite often due to its long profile. Springs on top of the turret tend to deflect shells into the turret. 90mm gun takes a long time to reload compared to its competitors. Slightly lower penetration in comparison to its adversaries like the Tiger II (H). Due to over-matching mechanics, the layered front is more of a weakness than a bonus due to the plates being only 38 mm by themselves, despite the total thickness of the front being 177.8 mm. The M26 Pershing helped the American armoured forces by bringing in the heavy 90 mm Gun M3 into service on a tank mount. The gun was similar in performance to the German's Tiger I's 8.8 cm KwK 36 cannon, but Army Ordnance wanted something to match the more powerful 8.8 cm KwK 43 cannon on the Tiger II. The development to match this cannon made the T15E1 90 mm gun; the gun was 73 calibers long, compared to the 90 mm Gun M3's 53 calibers length. The first produced guns were called the T15E1 and had a large fixed ammunition. The gun was mounted on a T26E1 tank #1, one of the few early prototype tanks of the M26 Pershing, which gave it the name T26E1-1. The extreme length of the T15E1 gun barrel caused the manufacturers to add a very prominent counter balance on the mantlet, which could be seen on the left side of the turret when facing it. The T26E1-1 would be the only M26 model with the T15 gun to see service in Europe. Among the troops, the T26E1-1 in Europe would be known by its eponymous name "Super Pershing" when compared alongside to the normal M26 Pershing. The T26E1-1 "Super Pershing" was sent to Europe and arrived sometime in March 1945. The T26E1-1 was assigned to the 3rd Armored Division and was given additional armour by the maintenance crew in hopes to keep it up to date against the heavier German tanks. The front hull had two large pieces of metal welded onto it, each 38 mm in thickness, with a space in between the metal pieces. These metal pieces were sloped more than the hull armour it was over. An additional armour piece was welded on the turret mantlet, the metal was taken from a Panther turret and was about 80 mm thick when welded onto the turret. 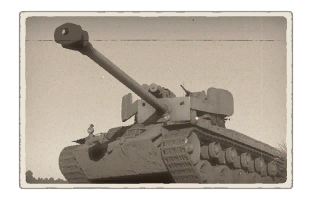 The T15E1 gun has much promise to the crew when using the tank as the gun could reliably penetrate the frontal hull of a Panther tank, a feat not many other American tank gun could claim at the time. The T26E1-1's performance in battle is largely written in the accounts of John P. Irwin, who was the tank gunner of the only active "Super Pershing" in the war. He mentions of three prominent combat actions with the T26E1-1, each one destroying the enemy with little difficulty. Records show that the T26E1-1 destroyed a total of three tanks and captured one after an extended firefight that left the opposing tank out of ammunition. Thought it was hoped to have the T26E1-1 fight a Tiger II for a rather explosive comparison, the T26E1-1 never saw a Tiger II during its tour in Europe. After the war, the T26E1-1 was most likely scrapped in the post-war demobilization as the final image of the tank was it lying in a vehicle dump in Kassel, Germany. The T26E1-1 "Super Pershing" gave the Americans a tank that excelled in anti-tank performance more than its younger brethren M26, it made a legend in the battlefield and a showcase of the new philosophy of how prepared the Americans were if come face to face with another superior enemy like they did with their Shermans against the Panthers. 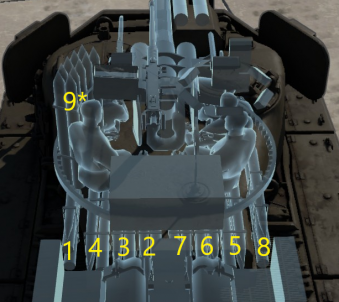 The T26E1-1 continued as an idea long after the war was over, with the next development arming the long 90 mm cannon in the T26E3 tank models, but the cannons used the new two-piece ammunition gun T15E2 rather than the one-piece one in the T15E1 when it was found that the long 50 inch rounds made loading prohibitive in the M26 turret. 25 of these tanks were built and were designated the T26E4. 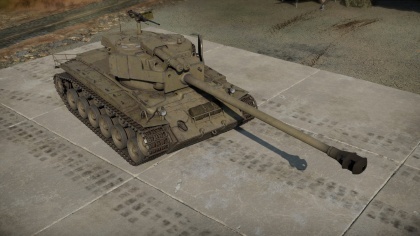 Another development was to convert normal M26 Pershings to mounting the T54 cannon, another development of the T15E1 which featured shorter ammunition. These tanks were redesignated the M26E1, but work was halted due to issues with the guns and a cut in project funds. This page was last edited on 12 March 2019, at 20:39.